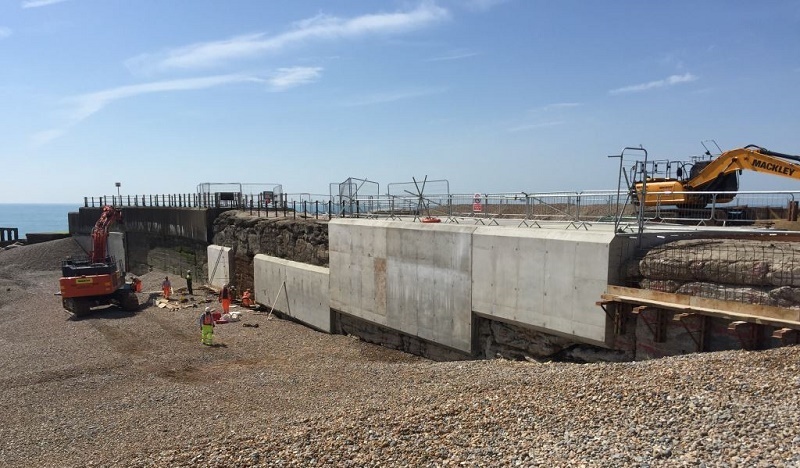 Mackley is making good progress with a scheme designed to maintain the structural integrity of the harbour arm in the historic town of Hastings on the Sussex coast. Under the scheme, which is being carried out on behalf of Hastings Borough Council, 6-9 tonne rock armour with crest level +5.5m OD will be placed at a slope 1 in 1.5 against both west and east sides of the harbour arm structure, and on top of the middle part of the structure where there are gaps. The existing ‘stabit’ breakwaters and broken concrete surrounding the structure will be restacked to form the core, together with 0.5 -1.0 tonne rocks to the base of the armour layers. Work on the inner section of the harbour arm has already been taking place. This has involved re-facing the structure with 300mm thick concrete – a total of 340m³ of concrete. This element of the works is now complete. “The harbour arm structure has two very important functions. 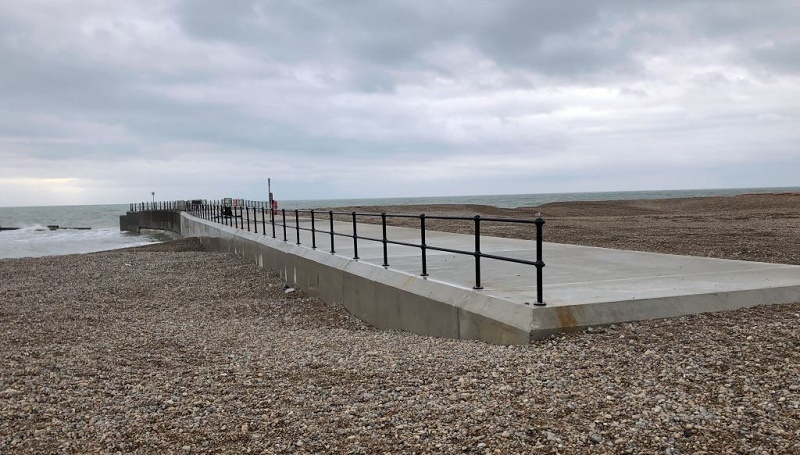 “First to retain Hastings’ main amenity beach to the west, which also serves as part of the town’s sea defence system offering protection to the highway and building infrastructure, including the proposed new development at Pelham Place. “There is also significant development, including car parks and amusements, on the seaward side of the sea wall along this length which could be at risk if left unprotected. Following a break for the winter weather, Mackley will return in the spring to complete the project with the placing of the rock.